The speaker is of very good build quality; there's a fair bit of weight to it but not so much to flaw the portability. It is very easy to set up the device and get the echo dot hooked up to it, but make sure you read to instructions to avoid any confusion. The battery life hasn't been tested while playing music, but the device was left on for less than an hour short of 12 hours, and two of the three battery indicator lights were still on. The speaker itself has a fair frequency response, the bass has a good punch and the treble is particularly clear. The bass does overpower the treble and mids though, making the sound a bit muddy at lower volumes. The device has had no problems as of current. Good value for money, especially considering the battery life, but may not suffice for audiophiles. The Smatree PS40 is a power bank with built-in speaker (no Bluetooth). 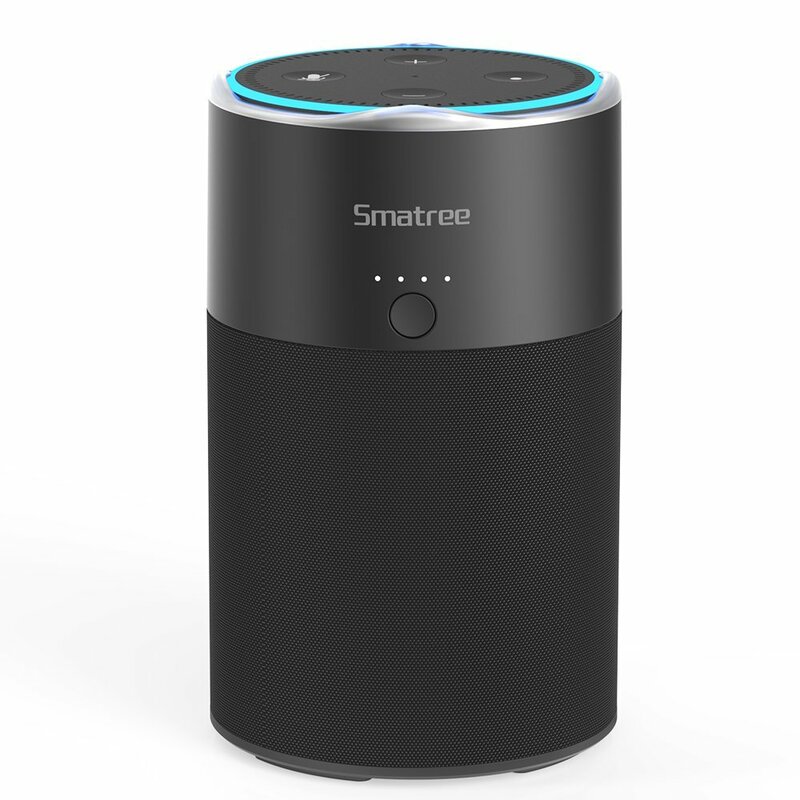 The case and connectors are specifically designed for the second generation Echo Dot. As a result, the Echo Dot fits seamless into the design as soon as it has been sunk into the housing and connected. 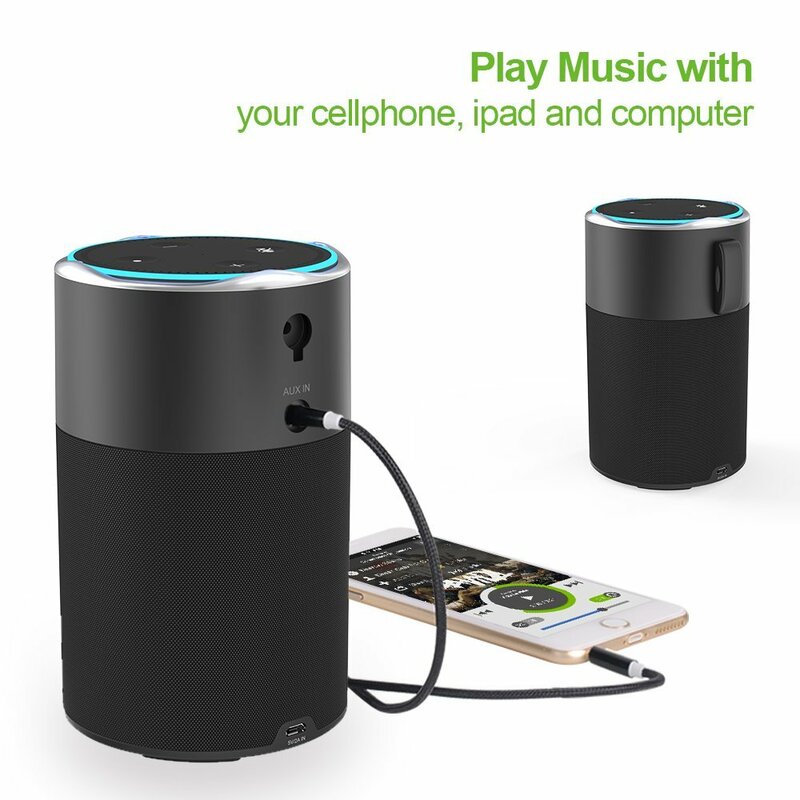 The PS40 transforms the small echo dot into a portable device that can easily be carried from one room to another without Alexa losing the connection to the WLAN. The speaker enhances the rather poor sound of the Echo Dot, making it a little party wonder. Of course you should not expect the sound of expensive hi-fi bluetooth speakers but the sound of the PS40 is powerfull and clear, with no noise or distortion. The assembly is very easy and takes only a few seconds. First, the micro-USB adapter is plugged into the USB input of the Echo Dot. Now you have two contact plates on the bottom that connects to the pins in the speaker. Put the Echo Dot in the PS40. You can not insert the Echo Dot incorrectly. Once the Echo Dot is in place, the audio output sits directly on the back and is accessible through a hole in the outer ring. Just below that you can see the audio input of the Smatree PS40. With the included audio adapter, you connect between audio output (Echo Dot) and audio input (Smatree PS40). Now the transparent retaining ring will be put on and screwed tight. This is done very easy and fixes the Echo Dot in the speaker. 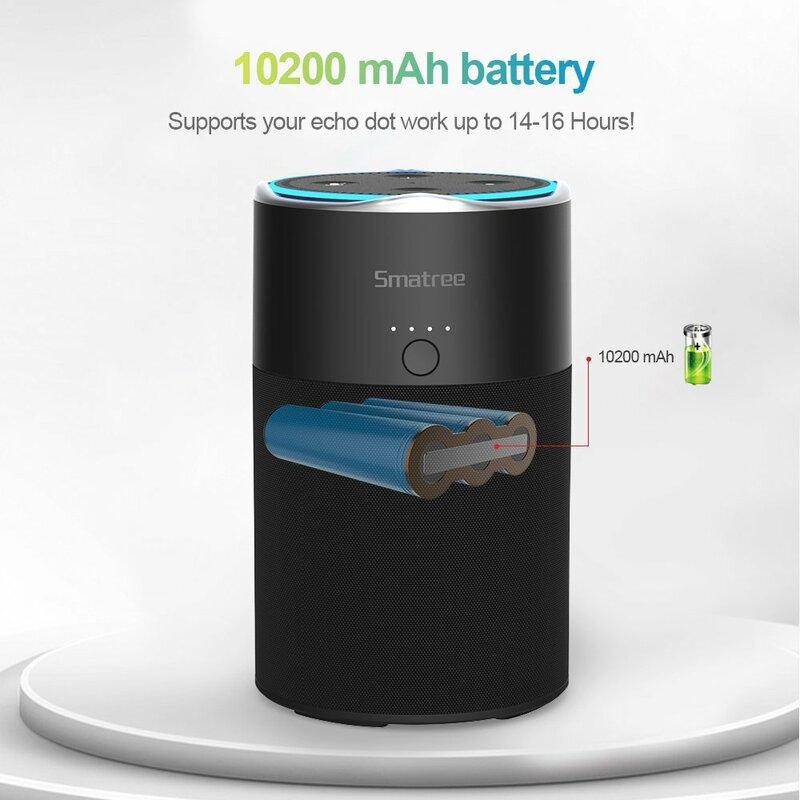 The functionality of the Echo Dot is not affected by the Smatree PS40. Due to the transparent holder even the glow of the ring is spread a little wider, which makes it very easy to see how the echo reacts to the voice commands. Further steps are not necessary. After the Echo Dot has connected to the WLAN, you can start. The PS40 is solid and high quality. The plastic is robust and stable. The supplied adapters for the power supply, as well as the audio transmission are perfectly fitting and sit firmly in place. Nothing rattles or wobbles. The complete box has a height of 15.8 cm, with the lower part of the box (about 10 cm) covered with fabric. On the bottom there are four glued rubber feet that provide a secure stand. Below the Smatree logo in the upper area there are 4 LEDs that indicate the state of charge of the battery. Directly below is a switch that allows the device to be switched on / off. During charging, the left LED lights red. The cells are charged with a charging current of approx. 1.8 A. After about 7 hours, the previously discharged battery was fully charged (charging current = 0.00 A) and had reached a capacity of about 9435 mAh, which is below the manufacturer's specification of 10200 mAh. Nevertheless, the available capacity is enough to play music for about 10-12 hours without interruption at medium volume. Another positive feature is that the charging electronic have protection against overcharging, over-discharging and short-circuiting. The micro-USB port for charging the battery cells is located at the bottom. 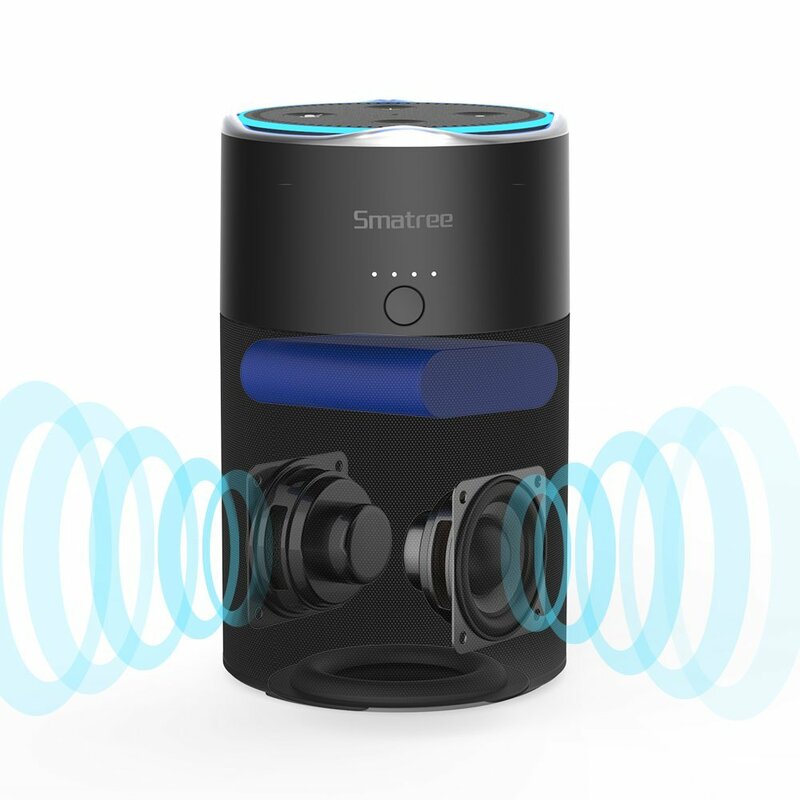 If the sound of the Echo Dot is not sufficient or you do not want to buy an Echo device for each room, you will get a good solution with the Smatree PS40, which turns the Echo Dot into a portable, flexible and powerful music package. Of course, you can also connect other devices via the Aux input. To connect a phone, MP3 player or similar, an audio connection is included in addition to the USB connection cable.